When I launched this Jekyll based site a while ago, I didn’t put any comment system, because I didn’t like any of the options available at the moment. Later, I was missing the interaction I had on my previous dynamic blog powered by SPIP, so I jumped in the Disqus train, because it was the most used around me, and on the sites I visited. Then generate the site, deploy, and it works! I hate how Disqus feels so slow when I browse pages using it. In fact, Disqus loads asynchronously, so it doesn’t really affect the Speed Index of the page on initial load and rendering, but I hate almost every use of lazy loading1, and Disqus’ one is really bad. I scroll the page to the post end, and then Disqus loads the comments and suggested content, pushing everything else, with an annoying repaint. I hate that. It makes me feel like the site is slow. This page’s weight before and after removing Disqus, as shown in my Dareboost monitoring. Disqus accounted for three quarters of the page weight! Disqus also requires a few rules in your Content Security Policy, but that’s manageable. Disqus being a third party service, we don’t know what our comments become and how Disqus tracks us accross blogs, how we are becoming the product. 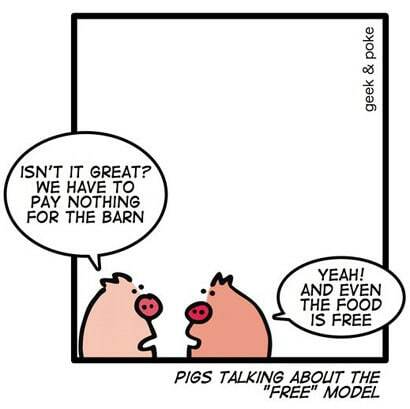 The famous Geek&Poke cartoon with pigs talking about the “free” model. I can of course export all comments to keep my own local copy, but it’s not as convenient as a true local storage. Some people also don’t like being forced to create an account on Disqus to be able to comment. If you use Disqus on your blog, please active the “Allow guests to comment” option in the settings! Comments history is not lost! Of course, removing Disqus could have meant losing the comments made so far. But I don’t like to lose valuable content. Some of the comments you make on my posts are even more valuable than the posts themselves! So, I used Pat Hawks’s jekyll-disqus-comments plugin to get a copy of all comments into YAML data files. I had to clean them a lot, mostly manually, because they were an HTML mess. Maybe not only because of Disqus, but also because they had already been migrated from SPIP before. The comments are shown below posts has before3, but they are now static, using a Jekyll template, without Disqus being involved anymore. I added Webmention to this blog a while ago, with some success on popular posts like How much data should my Service Worker put upfront in the offline cache?. I had to turn off comments on my recent posts due to them being used as a vector for anonymous abuse. New site will use Web Mentions. I discovered Webmention a while ago thanks to Jeremy Keith’s experiments with Webmention on his own blog. Webmention is a W3C recommendation since January 12nd 2017, based on the great work of IndieWeb people. Alex has thoughts in response, so also posts a blog entry linking to Frankie’s. Trackbacks and pingbacks failed mostly because of SPAM, and IndieWeb is taking this seriously for Webmention’s future, with intense work on Vouch, an anti-spam extension to Webmention. Let’s hope it gets implemented soon everywhere. James Richman explains in this post: Is W3C Replicating the WordPress Pingback System? webmention.io “is a hosted service created to easily handle webmentions (and legacy pingbacks) on any web page”. I use it as my Webmention endpoint. This is an open source project built by Aaron Parecki, co-founder of IndieWebCamp and editor of the W3C Webmention and Micropub specifications4. Bridgy “pulls comments, likes, and reshares on social networks” (Facebook, Twitter, Google+, Instagram, Flickr, etc.) and push them to my Webmention endpoint. This is an open source project built by IndieWeb people, and is free to use. 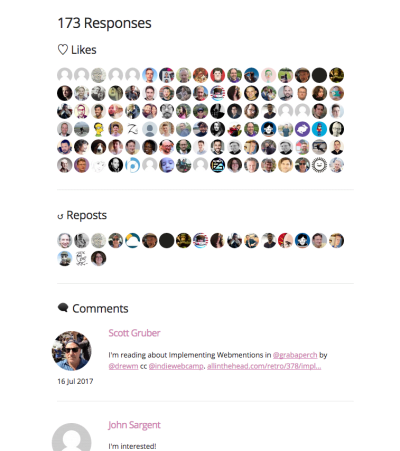 Once Webmentions are in webmention.io, they are pulled into my jekyll sources thanks to Aaron Gustafson’s jekyll-webmention_io plugin for Jekyll, and added to my posts pages. All of this is great, but there are a few issues I’ld like to fix as soon as possible. First, there are some Webmentions that should not be shown, either because they are useless, or because they are duplicates. webmention.io now provides a way to remove mentions, and will evolve to add a block function. Nice facepiles for likes and reposts on Drew McLellan’s site. I also have issues with some avatars that come directly from Twitter, and are really heavy. The new version of Aaron’s Jekyll plugin will allow me to define my own template, and use Cloudinary to resize and optimize these images. I have yet to try it, because I’m still using the old single file version, while the new one is now a gem. Simple —yet really valuable— Webmentions as likes and reposts are now simple facepiles. They are the most abundant Webmentions, so it helps reduce the length of the page, and make the actual mentions more visible, most being replies on Twitter. Also, I’m now using my own templates for all these Webmentions, and I use Cloudinary to optimize all avatars (size, format and weight), and reduce the number of domains from where ressources for the page come. Also, default links to avatars that came from webmention.io where in fact soft redirects (302) to the actual URL on Twitter’s servers, so there was an additional latency to get them. Looks like I’ve killed two birds with one stone! It looks like Webmentions is getting more traction every day (here Tim Kadlec planning to replace Disqus with Webmentions), I hope 2018 will be a great year for them. I’m heading there too. Thanks for having the way! Ce qui n’est pas un problème puisque l’échange n’a ni pérennité, ni lien avec une publication plus fournie. De plus, je soupçonne qu’il n’ait pas de conclusion non plus. On l’aurait sans doute eu, mais moins rapide/informel. C’est complémentaire. Yeah. I was certainly thinking about that. I didn’t have much comments anyway, but most of all, I really like WebMentions and other distributed systems. I think I gotta do this soon too!